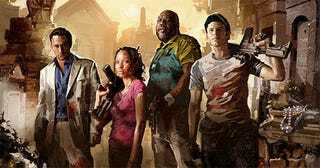 Despite early concerns that it was too soon for a sequel, Left 4 Dead 2 has sold more than 2 million copies at retail, doubling the sales to date of the original game. Gamers made noise when the sequel to last year's cooperative survival horror title was announced earlier this year, but the quick follow-up doesn't seem to have hurt Left 4 Dead 2's sales figures. More than 2 million copies of the PC and Xbox 360 versions have sold at retail, a figure that doesn't even take Steam purchases into account. That's great news for Valve, who in turn have more great news on the way. "Left 4 Dead 2 is off to a great start with strong support at retail and great reviews from the press," said Doug Lombardi, VP of marketing at Valve. "Meanwhile the title has already been played by over 1 million Xbox LIVE Gold account holders, and news regarding L4D2 DLC 1 is coming very soon." I'd urge our readers to keep their eyes on Kotaku for said DLC news, but that's no way to survive the zombie apocalypse.